The Scott E-Aspect 920‘s most notable feature is its sleek design with the very neat mid-drive motor blending nicely into the frame and the integrated downtube batteries. Scott have a long history of manufacturing high quality e-bike and these days have a wide of range to choose from. Motor manufacturers Brose are relatively late entrants to the e-MTB market and came to prominence by partnering with fellow German mountain bike manufacturers Rotwild. The motor itself is known as being relatively lightweight (stated weight is around 3.4kg), very quiet and with a good power to weight ratio. It’s worth noting that, like Yamaha, Brose allow e-bike manufacturers to tune the software of the motor themselves so no two Brose bike models will necessarily be the same (though they will share the broad performance characteristics of the motor). The battery is an industry standard 504Wh capacity and made by respected and reliable German battery manufacturer BMZ. Before I get onto the riding qualities and capabilities, here’s a quick walk round review of the E-Aspect. At around 22kg the bike is a pretty good weight for an e-MTB and again the minimalist design stands out when looking at the details. 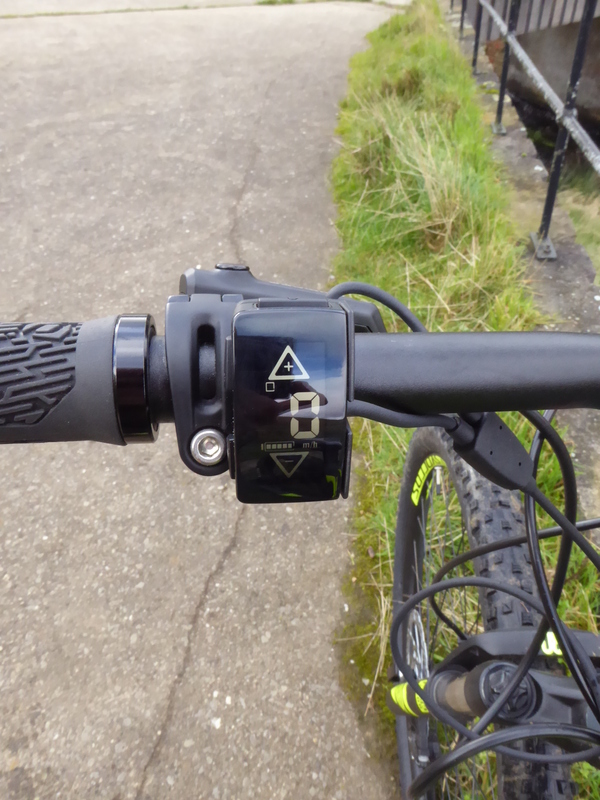 The combined info display and handlebar control is superb for easy control of the three power levels and has a backlight for night riding too or strong sunlight. It displays only your speed in mph and has a battery capacity indicator and a small of squares showing what your power level is. And that’s it. If you want more info you’ll have to look at other systems and if your eyesight isn’t fairly acute you might have difficulty picking out the details other than the speed. But for a minimalist display it’s the sleekest we’ve seen and the rocker swith to move power levels up and down is dead easy to use. As you would expect from any modern e-MTB the bike has several features that add to the strength of the bike and have been common developments over many MTBs in recent years, namely the through-axle on the rear of the bike and the semi-integrated headset. Such features are mainly there to add strength to these parts of the bike and so you can rest assured in terms of reliability and strength this model is pretty much industry standard. There are also technical developments meant to improve riding such as the small ‘clutch’ mechanism’ on the rear Shadow Plus 10 speed derailleur. This is meant to stop the chain coming off. There is a huge amount written about the various aspects of MTB frame geometry, wheel size and its effect on bike handling. This is written by very highly-skilled riders who may (or may not) really be able to tell subtle differences between frame designs etc. I’m not an expert rider so I’ll outline the basics of this hardtail design: being a hardtail it’s aimed at more moderate trails, but that said it’s surprising the terrain it will tackle if you simply run the tyres at a low pressure (see below). It has a moderate amount of travel in the front suspension forks – around 100mm – so it’s not meant for dropping off big rock steps, especially with very heavy riders on board, but again see below for the pretty rough terrain it was able to tackle. Lastly it has 29″ wheels. These roll over bumps slightly more easily than the two other size wheels commonly used on MTBs, 26″ and latterly 27.5″. 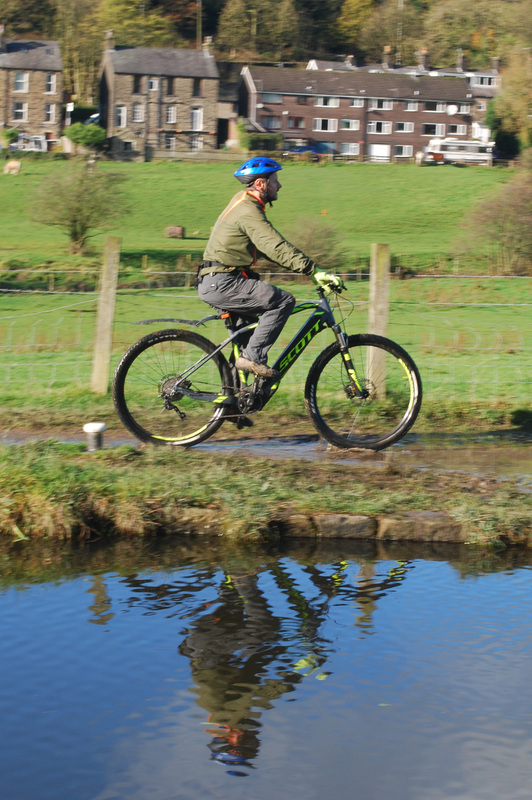 29″ wheels are great for stable handling and also longer rides on forest roads and canal towpaths and the like. In short this is a bike aimed at someone getting into e-MTBing and who likes forest trails and wider paths but will also want to mix it up with some rougher riding from time to time, without going to the extremes of e-MTBing where smaller wheels might make for nimbler handling, assuming you are already pretty handy with the e-MTB skills. 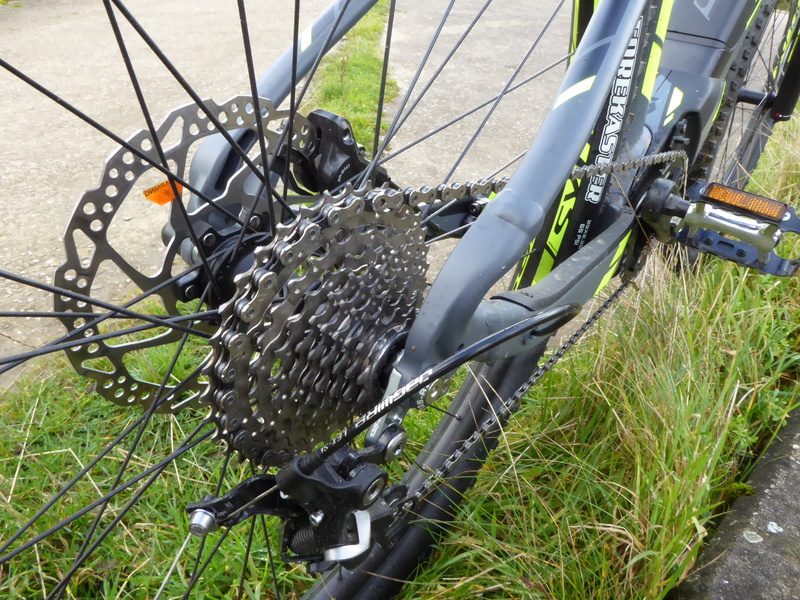 Again, the E-Apect’s 10 derailleur gears aren’t designed to give the maximum gear range available (11 and 12 speed derailleur systems are available) but 10 is plenty for moderate and rougher trail use – especially as the powerful motor here largely compensates for the lack of an extremely low ‘granny gear’. My only real was common to a most hardtail e-MTBs: the lack of mounting points for a rear rack. With that you would be able to have a bike capable of rough-stuff type touring as well as e-MTB day riding. Of course, it’s possible to mount racks using fittings such as p-clips and seatpost clamps but they aren’t really an elegant solution). There’s a also a word of warning that the E-Aspect is best ridden in shorts or skin-hugging lycra-style leggings – de rigeur for most ‘serious’ MTBers you see out on the trail. The reason is that the chain keeper over the front chainring can act as a trap for loose clothing. 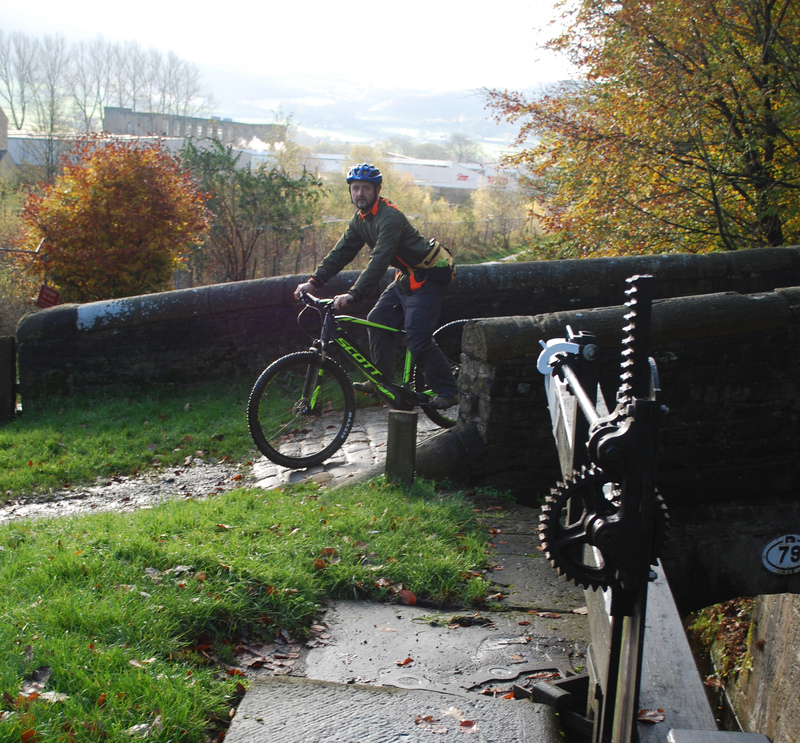 We start off whizzing along the Huddersfield Narrow Canal towpath in Greater Manchester’s Tame Valley. My test bike is the large frame model with around a 48cm frame measurement but it’s still perfectly comfortable in a relaxed sitting position a I scoot along the wonderfully attractive towpath. The real test comes climbing out of the attractive Lancastrian old weavers’ village of Diggle on the wonderful Pennine Bridleway. There’s a long steady climb of around 150m / 550ft of climbing and I notice all the MTBs we encounter are going down the hill not up it! 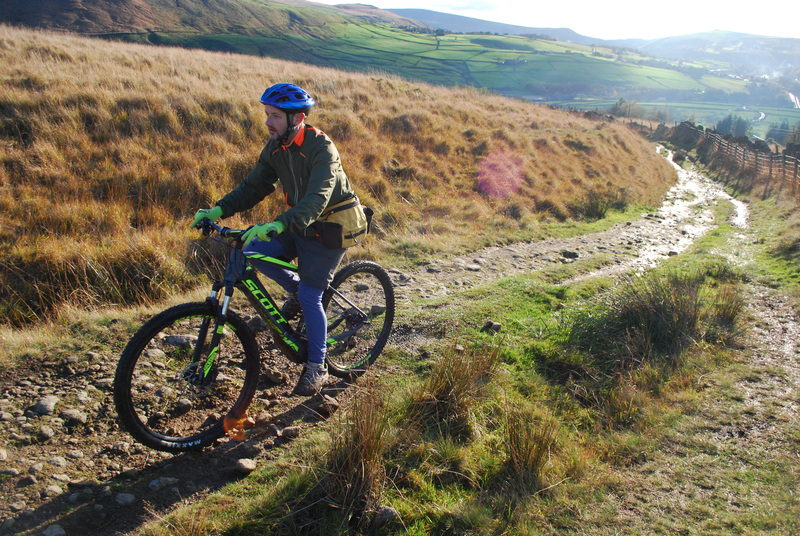 The trail proves an ideal test for the E-Aspect – there are rocks and very small rock steps, a few ruts and mud but this National Trail has been made with the average MTB rider in mind rather than the expert fanatic. I quickly realise the Brose motor is plenty powerful enough for climbing here; its just a matter of picking the right course, keeping weight over the back wheel on the steeper sections and keeping pedalling. The power delivery is extremely intuitive and enhanced by the quietness of the motor; whisper quiet in power level one and with only a quiet whirr in levels two and three. If you want to know more about how it works, complete with an explanation of belt drive, epicyclic gears and triple sensor technology check out the video below. 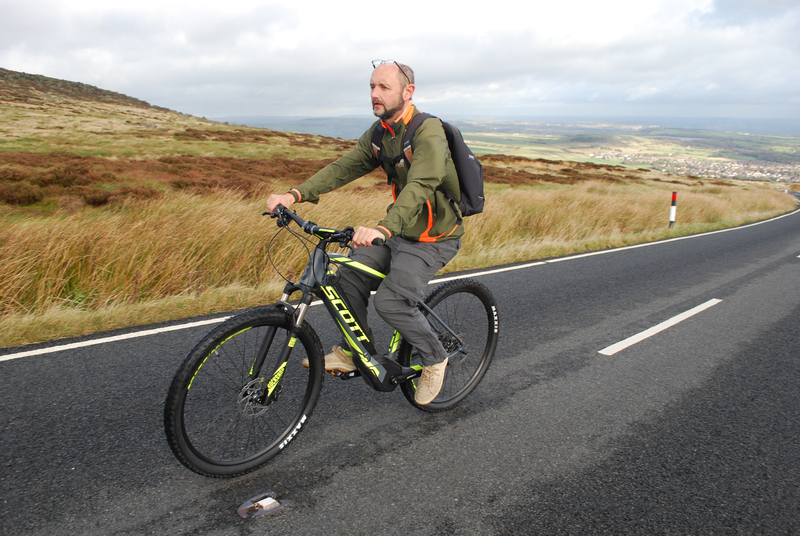 The practical upshot is the ability to climb trails like the following that I would struggle to ride up without assistance, and as the man in the video says, the smooth power delivery feels like it’s in perfect harmony with your own human power input. Level two provides plenty of power to get by right to the top so no doubt the bike would easily tackle much stiffer climbs than this too, subject to my ability to stay on the bike…Also level one is useful for smoother, less steep sections and lets you get a decent amount of exercise too. A final point worth making about the Brose motor is that even above the assisted cut-off speed of 15.5mph it still feels pretty good to pedal; moreso than many other centre motors that I’ve tried. 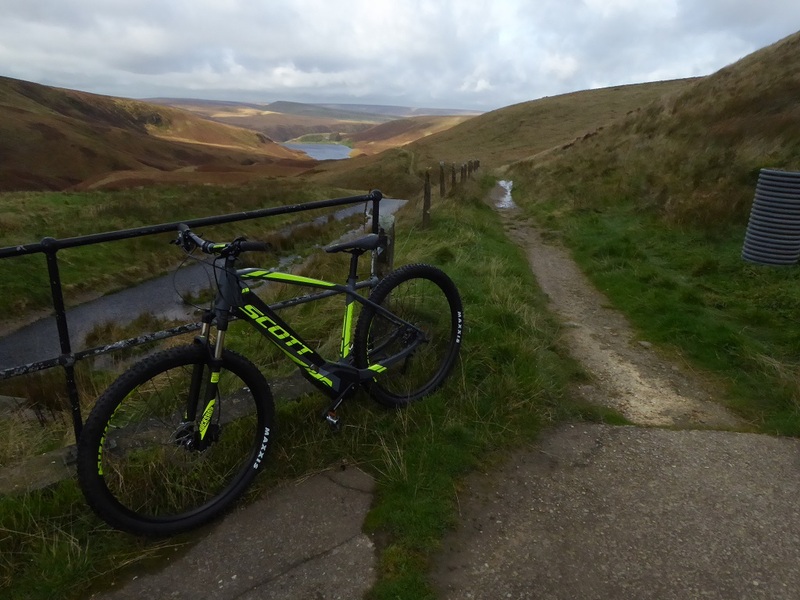 All in all the Scott E-Aspect is one of slickest, quietest and easiest to handle e-MTBs out there and is highly recommended.